Colin Simpson is walking around near the third-base dugout. It’s before a game during the early part of the Chatham Anglers’ season. Most of the players on the team are relaxing before the action begins in a few minutes. So is Simpson. Then, seemingly out of nowhere, Simpson’s knees bend slightly. He jumps up into the air and flips, as the number 10 on the back of his pinstriped jersey becomes parallel to the ground. He then grabs his legs, as his head is now the closest part of his body to the ground. Simpson continues to flip and prepares for landing, which is perfectly executed. “What everybody thinks about with Colin is that he can do a backflip,” said Cody Semler, a member of the baseball staffs at Oklahoma State and Chatham. 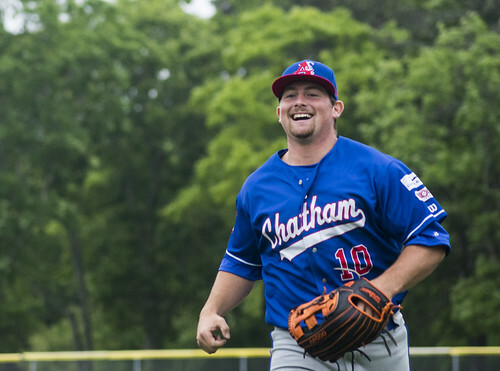 Simpson, a rising senior at Oklahoma State who is nicknamed “Tank” because a coach once told him he looked like a tank, has been an everyday left-fielder in Chatham manager Tom Holliday’s lineup since the season started on June 12. The road Simpson travelled to get to Oklahoma State, and now Cape Cod, is far from the typical journey of a baseball player. The usual anecdotes in an athlete’s tale — the other sport and the big injury for example — are found in the narrative of Simpson’s career. But, in Simpson’s story, the details are unique, leading to an interesting look into how the Edmond, Oklahoma native became the player he is today. Simpson is an all-around athlete, and that can be traced back to his time at Oklahoma Gold Gymnastics. Simpson’s mother, Christi, was a gymnastics coach at the center so Simpson and his sister, Mallory, would play on the equipment. Christi signed the two up for classes when Simpson was three or four. It did not take long for Simpson to excel at the sport. When he was first able to compete competitively at 6 years old, he won a state championship. But, the gymnastics lifestyle was not an easy one. Simpson went on a two-year hiatus from the sport when he was 10. When he returned to the mat at 12, his love for the sport was not same and he quit gymnastics for good. The decision worked out for Simpson, but he said he does believe he could have reached the highest level of gymnastics. “If I had just stuck with it what I was doing and if could have gone to college for it, I think I could have had a chance of making the Olympics,” Simpson said. When Simpson joined Oklahoma State, he was slated to play significant time for the Cowboys. But in his third game of his freshman season against North Carolina, Simpson broke the hamate bone in his right hand. The injury required surgery, which Simpson underwent soon after the injury occurred. The 5’9” slugger was back in about a month’s time and played 32 games the rest of the season as the Cowboys reached the College World Series. But something was off. During the surgery on his hamate bone, the doctor accidentally clipped the nerve in Simpson’s hand. But Simpson did not know about it until months later. After discovering that the nerve had been cut, Simpson had a nerve graft in September of 2016 to try and repair the injury. The surgery was a success and Simpson’s hand has progressively gotten better. The nerve damage had a slight effect on his hitting ability, Simpson said, but drastically affected his throwing ability. Simpson had to relearn how to throw a baseball, which he said has been his biggest challenge he has faced on a baseball field. The challenge to relearn how to throw has taken a lot of time and energy from Simpson — who, when he first came back, had to throw submarine style to feel the whip in his arm — but challenges and Simpson go hand-in-hand. Towards the end of the 2017 regular season, Oklahoma State was in a difficult spot. The team was 24-25, and 6-14 in conference play, putting them in eighth in the Big 12 standings. With only one series left — the Bedlam Series against ranked Oklahoma — Simpson and the Cowboys needed to win in order to secure their spot. The Cowboys swept the Sooners in the two games series, and clinched the eighth seed in the Big 12 Tournament. When the Cowboys arrived in Oklahoma City for the Big 12 Tournament, not much was expected from them. No eighth-seed had ever won the tournament. Oklahoma State went on to upset top-seeded and then-No. 3 ranked Texas Tech, 3-0, as Simpson finished the game 2-for-4 while scoring two of the Cowboys’ three runs. Simpson stayed hot and had one of the best games of his career against West Virginia. In the top of the first, Simpson gave his Cowboys an early 2-0 lead by hitting a 3-1 pitch from BJ Myers into the right-center field stands of the Bricktown Ballpark. Simpson’s left-handed stroke then put West Virginia’s hopes of a comeback out of reach in the sixth, when he launched second homer of the day — this time a three-run blast — to put Oklahoma State up 8-2. Simpson would finish the day 4-5 with two homers, a double, five RBIs and three runs scored. Simpson’s offensive prowess did not show in the final two games of the tournament, as he only managed one hit the rest of the way, but he still made an impact from his spot behind the dish. When Texas’ David Hamilton popped out in the Big 12 Championship game, giving Oklahoma State the conference championship, Simpson was behind the plate, like he had been for all 37 innings of the tournament. After dominating in the Jayhawk League last summer, hitting .451 with a .797 slugging percentage, Simpson had his best college season to date this spring. He hit .280 with a .382 on-base percentage and 18 long balls, ranking second in the conference, as Oklahoma State finished in second place in the Big 12 and played in an NCAA Regional for third time in Simpson’s three years. 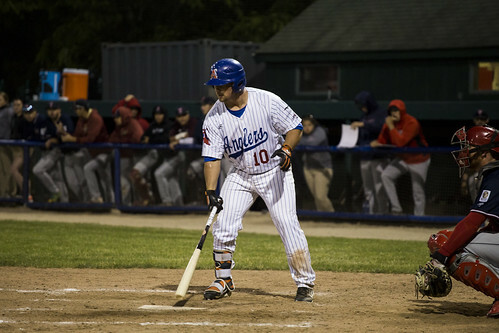 While he has struggled so far during his time in Chatham, Simpson has not been playing his normal, and favorite, position — catcher. Instead, he has been patrolling left field for the Anglers, playing all of his defensive innings at the spot. He has also been putting in work at a different position before games. With assistant coach Randy Whisler, Simpson has been taking ground balls at second base. Simpson said his coach at Oklahoma State, Josh Holliday, said it would help his draft stock if he could play left field and second base in addition to catching. Simpson has the rest of the summer and his senior season at Oklahoma State to prove to MLB scouts he can play at the next level. Simpson — who was not drafted out of high school — was not taken in the 2018 MLB Draft. One day, Simpson hopes to be able to showcase his talent on the biggest stage. He knows that it will take time and effort, but he is just fine with that.